Bed bugs have nothing to do with how dirty or clean a home is. Anyone at any time can unknowingly bring one of these uninvited guests home with them. Bed bugs are found in five-star hotels, luxury homes, small homes, shelters, schools — anywhere people are coming and going. They are hitchhikers that grab onto your clothes or get in your bags in order to get into your home, office, or building. However, clutter can help an infestation grow quickly. Stigmas still exist regarding having a bed bug infestation, and the stress of knowing bugs are in a home causes people considerable stress – and, in some cases, long-standing psychological problems – even after the bugs are gone. At Northwest K9 Bed Bug Detectives, we understand how stressful it is to have to handle an unanticipated situation like bed bugs. We take the time with each client to assess the situation and provide information so they can make the best choice for them. Why Can’t I See Any Bed Bugs When I Look for Them? Bed bugs also love to hide! The majority of a bed bug’s life is spent hiding, which is why we have found them in strange places like remote controls, TVs, headboards, fire detectors, walls… virtually anywhere. They also range in size. “First instar nymphs” are so small they are almost undetectable to the naked eye and require a magnifying mirror to see, while an adult bed bug is only the size of an apple seed. Another reason bed bugs are hard to spot is because their habits make them hard to find. They typically remain still unless they are going to “feed,” and they normally feed from 12 p.m, to 5 a.m. when people are sleeping. How Quickly Do Bed Bugs Populate? Bed bugs can populate at a exponential rates due to their biology and habits. One female bed bug can produce more than 30 thousand bed bugs in just six months, and she can lay seven to 10 eggs daily. An apartment infestation can quickly move from unit to adjacent unit and grow into a full-blown, building-wide infestation building within a few months. Early detection and intervention is vital to eliminating these bugs! If left alone, an infestation will become extremely difficult – if not impossible – to eliminate except through whole-building fumigation, which is so expensive it is reserved for only the most severe commercial infestations. Why Can’t I Just Wait Them Out and Stay Away From My Home Until They Die? Bed bugs many need human blood to survive, but they can live for many months without feeding. Attempts to wait them out are ineffective unless the structure is left for a year or more. Why Is It So Difficult to See Bed Bugs? First-stage and second-stage nymphs are extremely small and translucent, making them almost impossible to see with the naked eye. Often, a magnifying glass is needed to see one with any clarity. In a bed bug’s life cycle (see picture), an egg becomes an instar, then a nymph, and then goes through five nymph stages to become an adult. 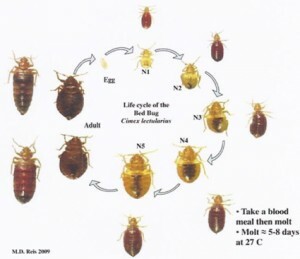 Because bed bugs look different at each stage, proper identification is difficult. The bugs shed their exoskeletons between stages of growth. This is referred to as molting, and unless an individual is trained to identify molting, their chances of finding this evidence of bed bugs are slim. How Do I Know If I Am Dealing With Bed Bugs and Not Another Type of Pest? infestation. Dogs can catch a small infestation much more quickly than a visual inspection alone. The key to a bed bug extermination with the lowest possible cost and least disruption is catching the infestation early. Why Invest in a Canine Bed Bug Inspection? Studies have compared canine detection with visual inspections, and the results using a well-trained detection dog provides up to a 97% accuracy rate for confirming an infestation. In comparison, industry experts agree that even a well-trained technician has only a 30-35% chance of detecting lower level infestations by sight alone. This low level of accuracy by visual inspections is why dogs were originally considered. The results have been great — dogs can find just one bed bug in a residence or other buildings. They are a much more accurate and efficient means for detecting a bed bug infestation. A dog can be trained on almost any scent, which is why they used by rescue teams, police departments, and now pest control companies. Why Has There Been a Sudden Resurgence in Bed Bugs? Bed bugs were almost eliminated in the 1950s. but have made a huge resurgence in the last five to seven years. There are many reasons why this has occurred. One is the reduction of baseboard spraying, which used to be done as a preventative bed bug treatment to keep pests out of homes. Another reason is the change in chemicals used during this time. DDT was the main chemical used to kill bed bugs years ago, and it worked well. The problem is that DDT was found to be harmful to humans and was banned. Regulations have toughened and few insecticides are approved to use indoors. The insecticides used today have lower toxicity levels for people and pets, but they are also designed for a different purpose. even when directly exposed to the poisons, while others have varying degrees of resistance. Turn to the professionals. 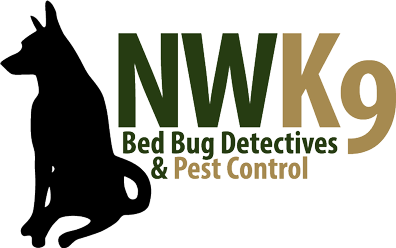 Contact Northwest K9 Bed Bug Detectives, your Seattle pest control experts, to schedule an inspection, and explore our treatment options to learn more!